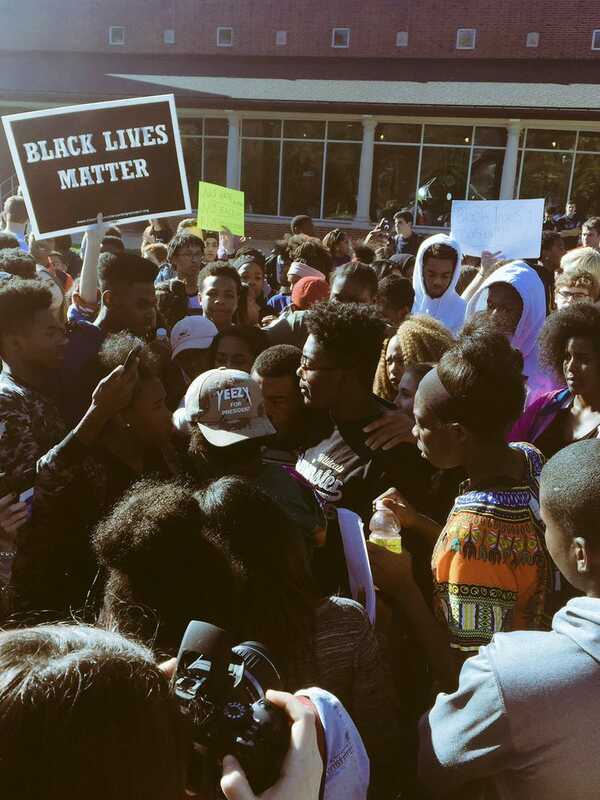 Ladue Horton Watkins High School students protesting Nov. 16, 2016, in Ladue, Mo. Tomorrow marks two weeks since more than 60 million Americans elected Donald Trump president of the United States, unleashing a wave of hate crimes and harassment against people of color across the country. The Southern Poverty Law Center reports that there have been 701 incidents of racial harassment since Election Day. In Missouri, where 57.1 percent of the votes cast were for Trump, a few occurrences have drawn some headlines. In a suburb of St. Louis, an Indian-American family woke to discover the word “Trump” etched on the side of the family’s car. But one of the bigger moments linked to racial harassment that made headlines in the Show Me State involved a group with many members who couldn’t even vote because of their age: high school students. These bigoted attacks remind you of scenes from the civil rights era, but they’re postelection realities. “I feel like people always had their underlying prejudices and biases and beliefs, but I think the fact that now we’re going to have a person leading our country who disregards the feelings of other people and is blatantly racist gave the people who are feeling that way on the inside the courage to be bold enough to just outright say it,” 15-year-old Ladue sophomore Tajah Walker told The Root. On Nov. 15, Lynette Hamilton wrote a post on Facebook sharing that on the same day as the bus incident, Nov. 10, her son Christian, 16, suffered third-degree burns on his arm and posterior when another student, 17-year-old Gabriel Vazques, put hot glue from a glue gun on his arm and chair, which he sat on. Hamilton filed charges, and Gabriel was charged as an adult with third-degree assault, according to the St. Louis American. Although in her Facebook post Hamilton identified the student as white, the Ladue School District and police said that Gabriel is Hispanic. And according to the police report, both the victim and Gabriel said that the incident was not racially motivated. But by that time, students had had enough, and over the next two days, more than 100 students gathered to protest the mistreatment and racial hostility that the school district wasn't addressing. LaShell Eikerenkoetter, a 27-year-old video production manager, live-streamed and posted the Nov. 16 protest on Facebook. “This shows why it is so important for us to build a community, a full range of community, from students that can go to Ladue to students that are living in poverty. It is so vital … because just because [they] get to go to a prestigious school like Ladue doesn’t take away racism or the oppression that we suffer every single day, especially living in St. Louis, Missouri,” she said to The Root. Racial division and tension in the region aren’t new; St. Louis is considered one of the most segregated cities in the United States, from religion to schools and housing, going back to the 1800s. Student enrollment in the district is 62 percent white and 17 percent black. According to data from the U.S. Department of Education Civil Rights Data Collection, in survey year 2013-2014, 43.3 percent of in-school suspensions, 42.7 percent of out-of-school suspensions and 100 percent of expulsions were of black students. Earlier this year, Tajah Walker said, she was repeatedly called disrespectful by a substitute teacher after she chose not to stand during the Pledge of Allegiance. The teacher also told her that she should “be happy to be in this country” and asked, “What country would you rather live in?” Tajah protested both days last week, and it was for more than herself. “It wasn’t just for, like, racism. It was for discrimination altogether. Because there are people at my school that are in the LGBTQ community, [who] don’t feel safe, either. Because they walk around school and get called ‘fag’ and stuff like that, and the school doesn’t do anything about it,” she said. Sydney Alexander, who has been in the district since the first grade, is a 15-year-old sophomore from Olivette, Mo. She told The Root that the school needs more minority staff the students can identify with and so that students can be taught by people who look like them. On Nov. 16 the district released an official statement (pdf) regarding the incidents on Nov. 10. Ladue School District Director of Communications Susan Dielmann spoke to The Root regarding the district's efforts moving forward. Later that afternoon, leaders of the district met with members of the county and the national NAACP. Still, at least one parent is insisting that the school district do more to ensure that students are provided a safe environment to learn.